LOS ANGELES – “Nipsey Hussle: A Celebration of Life” included stories from his parents, a letter from a president, representations of Christianity and Islam as well as nods to Eritrea, where the rapper’s ancestors came from. The public service at the Staples Center was scheduled to begin at 10 a.m. PDT/1 p.m. EDT but did not get underway until nearly an hour later because of a security delay that left thousands of fans waiting let to be inside. Hussle’s casket appeared onstage in front of a wall of flowers and greenery. The rapper’s face was projected on monitors, accompanied by the words “Nipsey Hussle: A Celebration of Life.” Hussle was fatally shot on March 31. Karen Civil tearfully read a letter sent from former President Barack Obama, who admitted he didn’t know Hussle personally but discovered his music through daughters Sasha and Malia. Obama, whose father was Kenyan, praised the Eritrean-American rapper for investing in his community and noted the STEM center and co-working space Hussle established. Performers included Anthony Hamilton (“Pass Me Over”), Jhene Aiko (“Eternal Sunshine”) and Marsha Ambrosius, whose rendition of Mariah Carey’s “Fly Like a Bird” included bits of Hussle’s song “Be Here for a While.” Stevie Wonder was also scheduled to perform. The rapper’s kids – daughter Emani and son Kross appeared onstage, where they were joined by Khalil Kimble, the son of rapper Skeme, and Kameron Carter, the son of Hussle’s fiance, Lauren London and rapper Lil Wayne, who addressed the audience. Attendees received nearly 100-page books with Hussle on the cover. Inside were dozens of photos of Hussle with his fiancée Lauren London and his children, along with messages from his family. “Sleep well King, The Marathon continues as a line of energy for all of us to consider. LOVE AND LIGHT,” wrote Jay-Z. “I’ve never cried myself to sleep over any public figure before, but Nipsey’s presence meant so much for our community,” actress Issa Rae wrote. “The book also contains messages from celebrities such as Michael B. Jordan, Ava DuVernay, Tiffany Haddish, Snoop Dogg and DJ Khaled as well as athletes like LeBron James and Russell Westbrook. 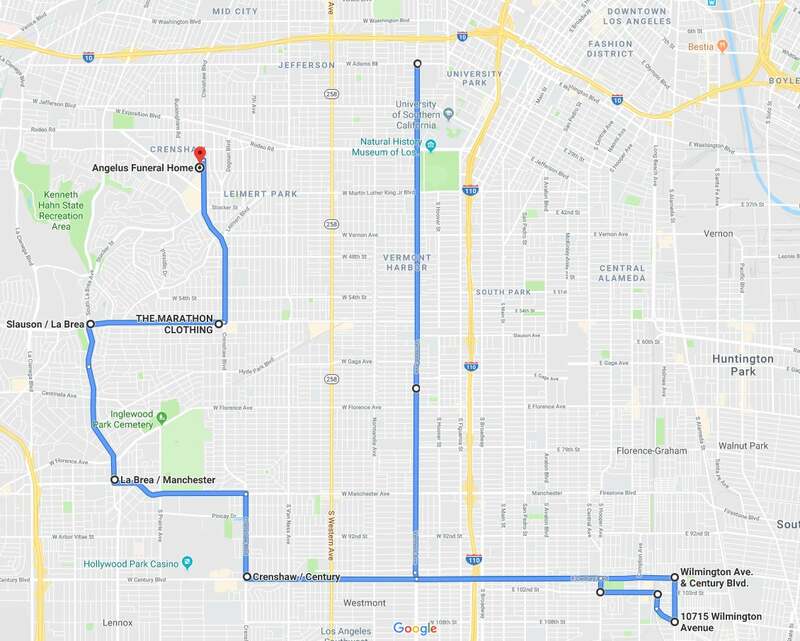 The two-hour event will be followed by a 25½ mile funeral procession through South Central Los Angeles, past Hussle’s The Marathon clothing store and ending at a funeral home in the Crenshaw district. The Staples Center has served as a public funeral space in the past: A memorial for Michael Jackson was held there in July 2009. Hussle, the 33-year-old rapper and philanthropist, was fatally shot and two others were wounded in front of his store on March 31. The suspected shooter, Eric Holder, 29, was arrested two days later and charged with homicide and other crimes. On April 1, the day after Hussle’s death, fans held a candlelight vigil in front of his clothing store. But the gathering turned violent: Chaos broke out and two women were wounded by gunfire, according to court papers obtained Wednesday by The Associated Press. People started running; 19 people were injured. Hussle was known for his celeb-adored mixtapes, his Grammy-nominated 2018 album “Victory Lap,” and his work to provide resources for his South Central community, where he started a STEM program. Before his death, Hussle had initiated work with the LAPD to end gang violence. Earlier this week, Los Angeles City Council member Marqueece Harris-Dawson announced he would formally submit a motion to name the intersection of Crenshaw Boulevard and West Slauson Avenue “Ermias ‘Nipsey Hussle’ Asghedom Square.” A Change.org petition had been started in the days after he was killed. Remembering Nipsey Hussle: Rapper’s parents speak; intersection to be named for him? His stage name, a play on the 1960s and ‘70s rhyming standup comic Nipsey Russell, was given to him as a teen by an older friend because he was such a go-getter – always hustling.